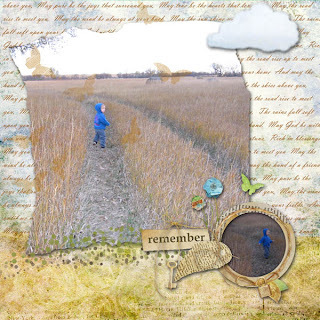 I used Loucee Creations: Birthday Cheer along with a clustering tutorial from Karen Diamond Designs. This was about like the blending trouble I had...need LOTS more practice to get clustering down. I also cut out the cake pan, which took awhile, but looks so much better than before. Update: This (not-so-great) layout was (randomly) picked to win LouCee Creations' shop at MyMemories! Thank you so much!! Another photoshop class project: blending papers. It was a bit tricky. I definitely need to put some time into practicing this one! I can "blend" okay, but I was trying to make the papers look worn and that takes skill. Yay! I love this stuff...now I just have to win it. Check out the Design House Digital blog for links to a blog hop filled with tips and techniques for digital scrapbooking, lots of chances to win prizes and downloadable freebies. Did my first speed scrap tonight. Only it wasn't too speedy when the computer kept locking up and I was using PSE 2.0! Layout instructions from Wendy Tunison, most stuff from Laitha's Designs: Attic Treasures, and Industrious, some from SNP collab: Bohemian Rhapsody, and A Saxon Creation: Vintage Rose. Learned how to use align and distribute to straighten up elements and alphas...pretty self-explanatory, but at least the tutorials always give lots of hints and tips. I ended up removing my title so I could put a background text layer for a challenge instead. I used the Happy Place Pack from Fly Pixel Studios again. The alpha I used was from SNP's Heidi Ho. This week we learned to do overlays and feathering (to blend the edge of the photo into the paper it's overlaid on.) I love it! I've been wondering how they did that... I still have issues with clustering...never can find the right elements to combine. I think that's because I'm trying to stay within one kit when I'd really like my files sorted by type and color: staple copper, staple silver, staple back copper, etc. Oh well, I guess I'd better learn to be a designer and change the digiscrap world--maybe next week. I used Scraps 'n' Pieces Thankful Hearts and Bohemian Rhapsody blogtrains.